Well, it had to happen eventually. “The Squire of Gothos” is not a great episode. It might have sounded like an interesting idea at the time, but the story has become clichéd to the point where it’s trite. I didn’t make many notes on this one as I was kind of cringing at the character of Trelane, who is played as over-the-top flamboyant by guest star William Campbell. Well, okay, the script calls for that, but it gets tiring quickly, especially when one knows the ending. Trelane is playful, irrational, and apparently all-powerful, much like Q in the later Star Trek series. There’s a recipe for an annoying character right there. The Enterprise is basically trapped near Trelane’s planet and Kirk and Sulu vanish from the bridge mysteriously. A rescue party beams down to find them, assuming they’re on the planet, and comes across a castle of all things. Inside the castle they see a taxidermied figure which is clearly the salt vampire from “The Man Trap“. At least that’s an interesting point of note. There’s also a mounted crocodile head, of all things, above the fireplace. Trelane captures the landing party and treats them to a meal, but the food has no taste. He magics a ball gown on to Yeoman of the Week Teresa Ross. Kirk eventually decides Trelane isn’t all-powerful, but that the mirror he stays near is his source of magical mojo. So he provokes a duel, and then takes the gun and shoots the mirror. I was amazed to hear the destruction accompanied by distinct “boing!” sound effects, like some sort of cartoon. 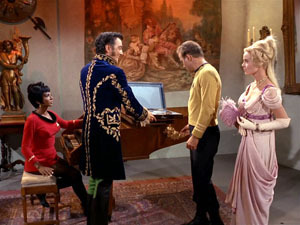 A failed escape results in Kirk being put on trial by Trelane and sentenced to hang. Kirk talks his way out, offering to let Trelane hunt him for sport. A fight ensues, with some awful swordplay, before the deus ex machina ending, in which Trelane’s parents – a pair of mysterious sufficiently advanced energy beings – scold Trelane for being a naughty child and drag him off for punishment. Blah, what an ending. If you didn’t know it was coming, you could be left wondering how Kirk is going to engineer an escape from this one. There would be a certain amount of suspense mixed in with the cringing at Trelane’s antics. But in the end Kirk does nothing and is saved by pure dumb luck and even more powerful aliens. All rather unsatisfying. Tropes: Large Ham, Aliens Steal Cable, Great Gazoo, Immortal Immaturity, Psychopathic Manchild, Magic Mirror, Stock Sound Effects, Kangaroo Court, Scheherazade Gambit, Hunting The Most Dangerous Game, Flynning, Sufficiently Advanced Alien, Energy Beings, Parent Ex Machina. This entry was posted on Tuesday, 19 October, 2010 at 18:11	and is filed under Star Trek. You can follow any responses to this entry through the RSS 2.0 feed. You can skip to the end and leave a response. Pinging is currently not allowed. So that’s where the joke in futurama came from!